Because the key to any productive life is a personal booze dispenser, Keurig announced on Friday that it’s teaming with Anheuser-Busch to create a product that can concoct "beer, spirits, cocktails and mixers," according to a company press release. Now, this should prove to be a milestone, considering there’s already a plethora of devices that claim to be the Keurig of Weed, the Keurig of Beer, the Keurig of Cookies, and so on. But Keurig intends to carve out its own niche amid the competition, and as CNN reports, it desperately needs to sell the product. Since Keurig was acquired for a whopping $13.9 billion in 2015, it’s stock has been declining steadily, because consumers just aren’t buying single-cup coffee makers. 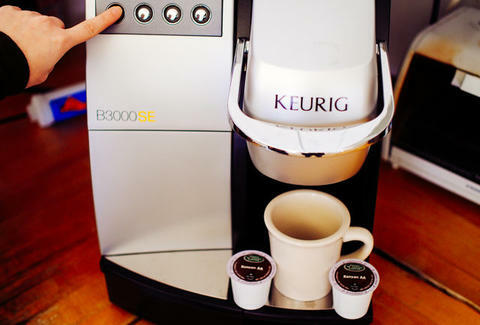 The eventual Keurig-to-end-all-Keurigs is still being prototyped, so don’t expect to see it lining the shelves at Sur la Table anytime soon. In the meantime, you can take solace in the fact that there’s an instant-tortilla machine -- which is basically the Keurig of tacos -- and a handy lube dispenser, which is aptly billed as the Keurig of Lube. We assume you get the trend by now.